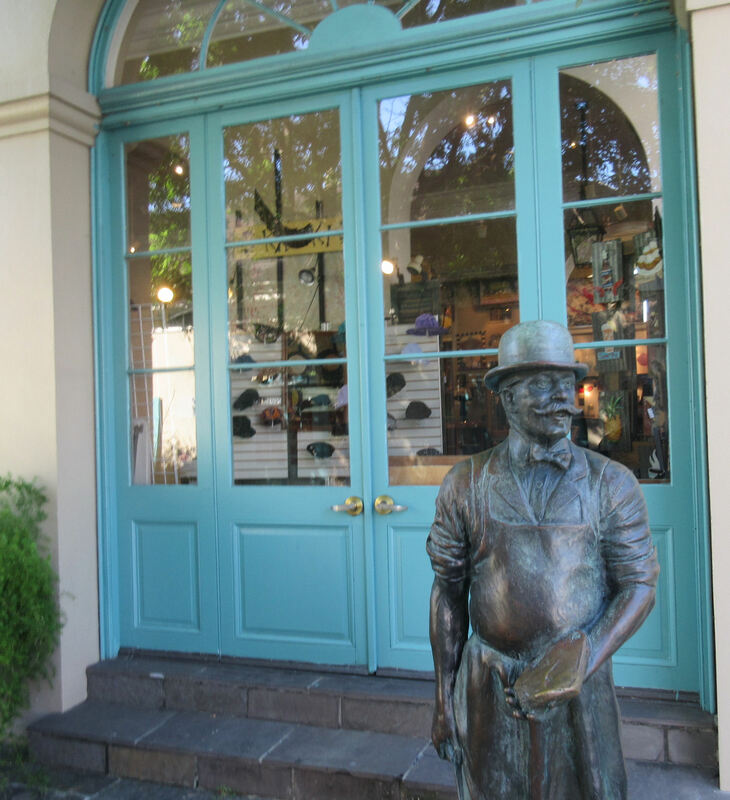 2015 Road Trip Photos #29: The Market and the Mint « Midlife Crisis Crossover! The French Market may seem empty around 10 a.m., but the calm and the extra personal space don’t last. Day Four was spent walking here, there, everywhere around the French Quarter — gawking at random sights, browsing festive shops, learning history from museums, weaving through crowds, and trying our best to withstand the 90-degree heat that kept hammering at us all along the way. Fortunately a few places offered respite from melting. 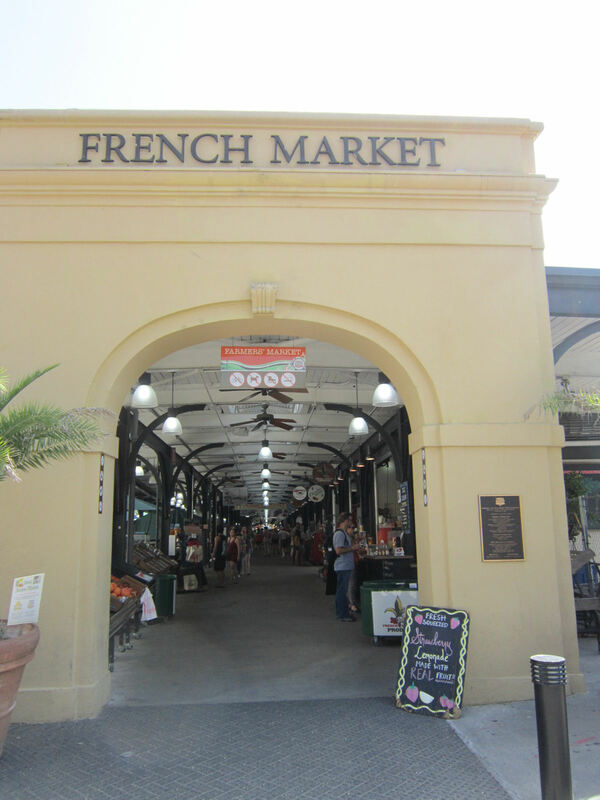 We’ve seen farmers’ markets in other cities including our own hometown, but the French Market is a renowned, permanent fixture spanning over a mile, with some spaces dating back to 1791. It contains all the local New Orleans color, flavor, texture, sound, and smells a tourist could possibly want. 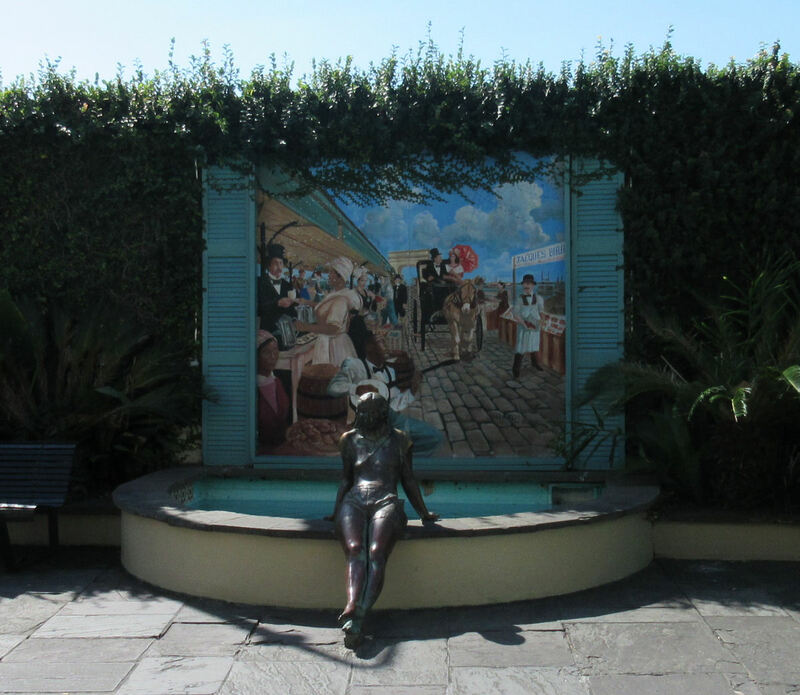 We first approached it on Day Three when we paid our mandatory visit to Cafe du Monde, but evening was too near and we’d had to flee before we could become victims of the night terrors that all the guidebooks loved mentioning. Cafe du Monde caps the south end of the Market, leading into a series of tiny brick-‘n’-mortar shops featuring numerous shopping specialties for those who came prepared. We’re not the kind of shoppers who accumulate armfuls of bags anytime outside Black Friday, and sometimes not even then, but we picked up a small item here and there for fun. Dum Dum Dugan welcomes you and thinks you need a better hat! 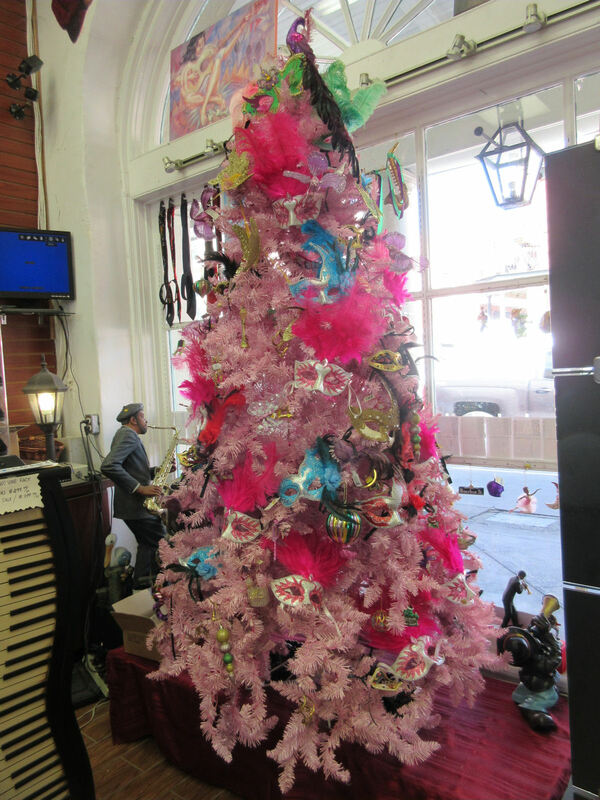 Pink Christmas in July! Somewhere out there are collectors who can’t live without this store. Tiny mural attached to the ceiling between shops, celebrating the jazz that is the city’s lifeblood. Over 80% of the souvenirs on sale in the various shops feature jazz images or cameos. Many feet beyond Cafe du Monde, we found another fountain in much healthier condition and with a bit more water pressure. The north end of the Market is a series of restaurants and fresh grocery stands, where we got lunch (we’ll get back to that in a future entry), resisted the urge to overfill on dessert, and didn’t brake for long at the clothing booths, especially one that had interesting items topped with some curious “NO PHOTOS” signs. 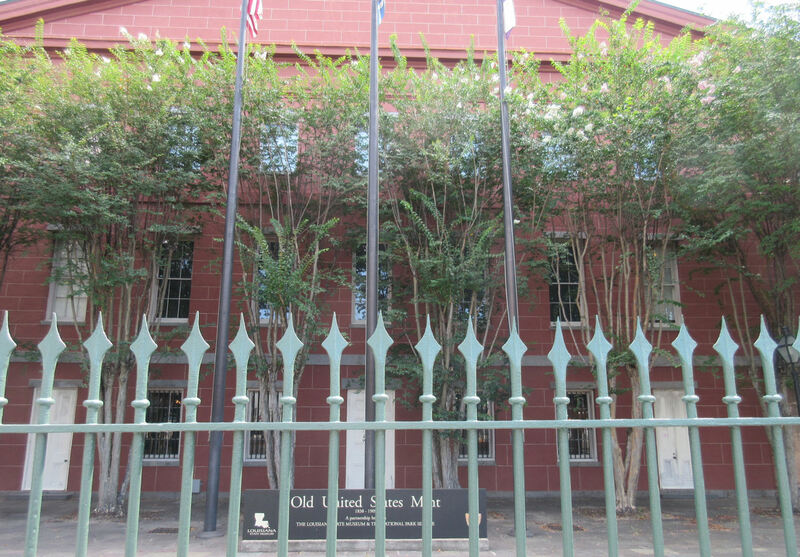 Just north of the Market is The Old U.S. Mint, one of several locations belonging to the Louisiana State Museum network. This version of the U.S. Mint began cranking out coins in 1838 at the behest of President Andrew Jackson, but in 1861 became a Confederate holding when Louisiana seceded from the Union. After the Civil War it returned to serving national purposes once more till 1909. After decades of shutdown, control was eventually transferred to the state, which reopened it as a museum in 1981. Hurricane Katrina caused another two-year shutdown, but it’s now back in business as an educational center for anyone interested in old money. The fence looks foreboding, but admission is free if you can spot the barely labeled door. Here’s something we didn’t expect: it kind of paled in comparison to other money manufacturing entities we’ve visited. We saw the Bureau of Printing and Engraving on our 2003 road trip to Washington, DC; we toured the US Mint in Philadelphia on our 2010 road trip; and we stumbled across the free-tour section of the Federal Reserve Bank of Kansas City in Denver (I still don’t get the name) on our 2012 road trip. Neither of us is a numismatics geek and we’ve probably seen all the old coins, bills, molds, and printing plates we’ll ever need to see. We’re good on moneymaking. But the Old US Mint offered free entry, shade, A/C, and water fountains. We figured why not. We were a bit confused when a shirtless guy in suspenders and costume bowler likewise walked around the halls in peculiar fashion, like some kind of pensive, off-duty clown. Maybe that’s normal for New Orleans on a Tuesday. We wouldn’t know. 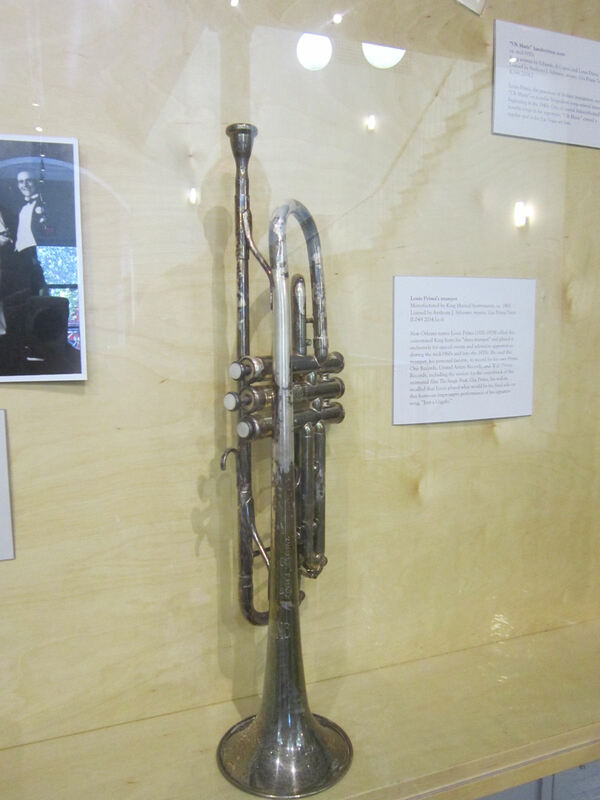 On the differently confusing side, we found a jazz exhibit in the money museum. Maybe the state mandates a minimum amount of jazz in every public building. 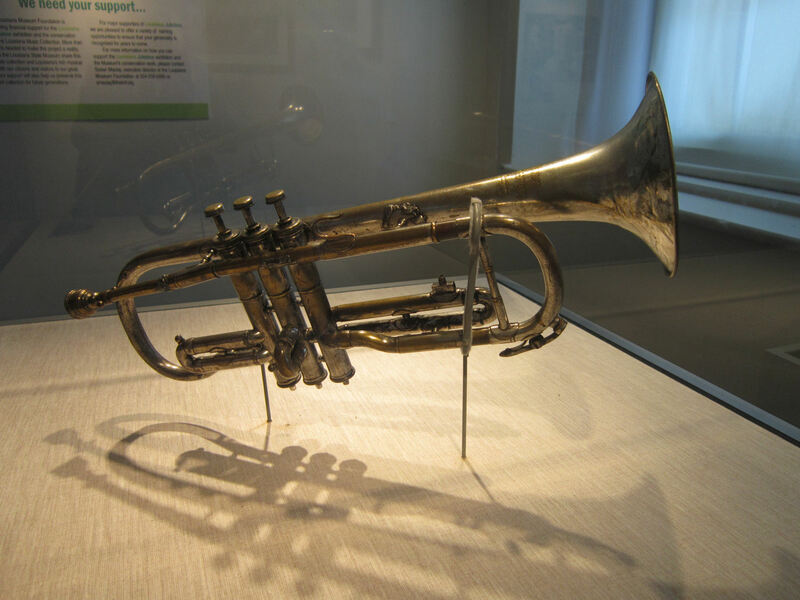 Louis Prima’s “dress trumpet” that he used for special performances, including but not limited to the recording of the soundtrack to Disney’s original animated version of The Jungle Book. 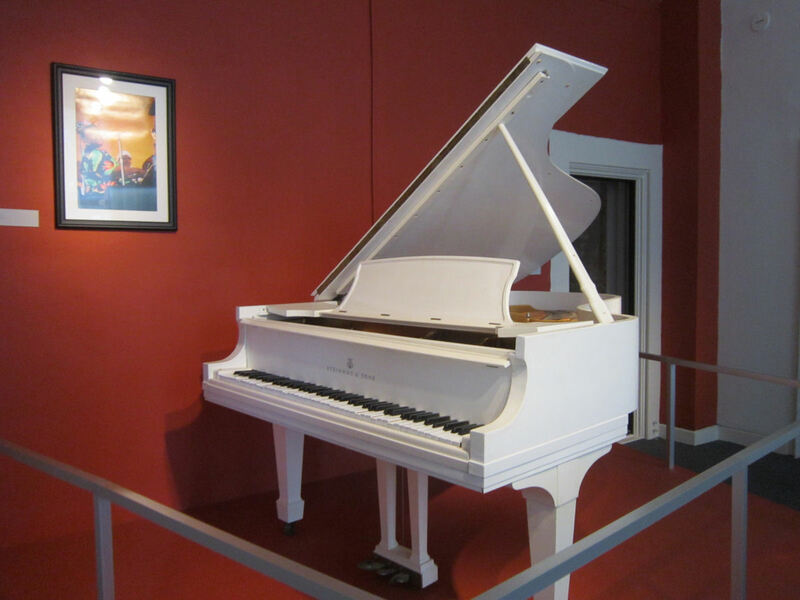 A Fats Domino piano! No public riffing allowed. 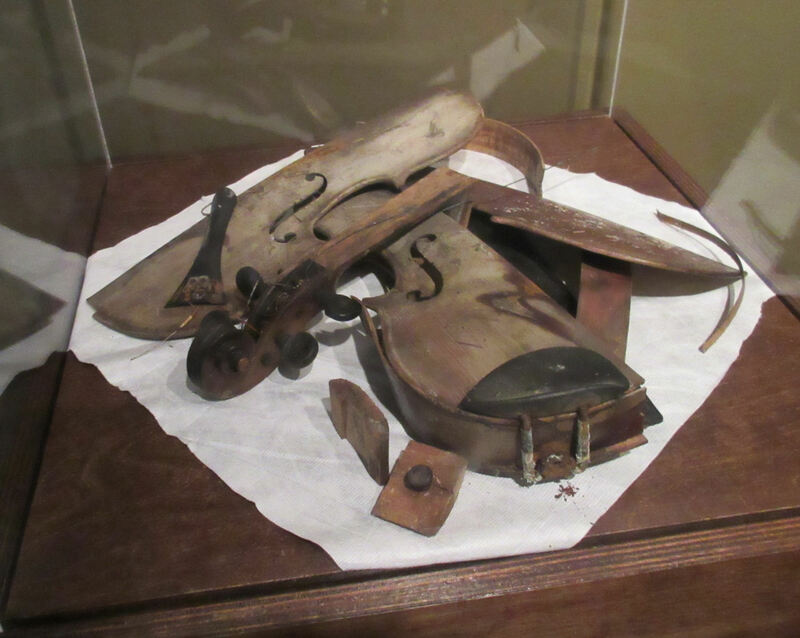 The remains of a fiddle once belonging to multi-genre legend “Gatemouth” Brown, whose house was destroyed by Hurricane Katrina. Brown was forced to relocate to Texas, where he died from preexisting lung cancer the following September. 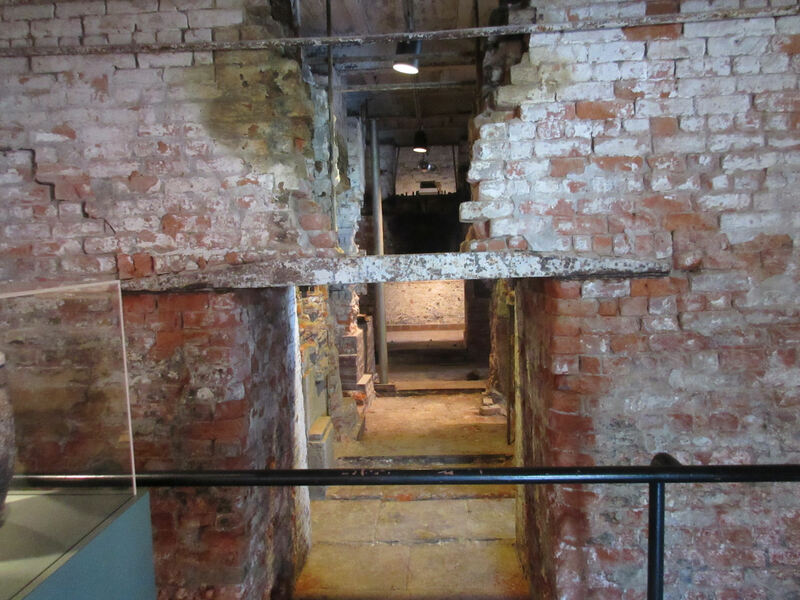 Also interesting to me was the portion of original building preserved in between the money exhibits as a sort of stabilized ruin. The Old US Mint has withstood a hard couple of centuries. It also reminds me of certain areas from Bioshock. Indeed! Even after the trip was over, it felt like we’d only scratched the surface.